A religion is a set of beliefs and practices generally held by a community, involving adherence to codified beliefs and rituals and study of ancestral or cultural traditions, writings, history, and mythology, as well as personal faith and mystic experience. The term "religion" refers to both the personal practices related to communal faith and to group rituals and communication stemming from shared conviction. All patriarchal religions present a common quality, the "hallmark of patriarchal religious thought": the division of the world in two comprehensive domains, one sacred, the other profane. Religion is often described as a communal system for the coherence of belief focusing on a system of thought, unseen being, person, or object, that is considered to be supernatural, sacred, divine, or of the highest truth. Moral codes, practices, values, institutions, tradition, rituals, and scriptures are often traditionally associated with the core belief, and these may have some overlap with concepts in secular philosophy. Religion is also often described as a " way of life". Religion has been defined in a wide variety of ways. Most definitions attempt to find a balance somewhere between overly sharp definition and meaningless generalities. Some sources have tried to use formalistic, doctrinal definitions while others have emphasized experiential, emotive, intuitive, valuational and ethical factors. Sociologists and anthropologists tend to see religion as an abstract set of ideas, values, or experiences developed as part of a cultural matrix. For example, in Lindbeck's Nature of Doctrine, religion does not refer to belief in "God" or a transcendent Absolute. Instead, Lindbeck defines religion as, "a kind of cultural and/or linguistic framework or medium that shapes the entirety of life and thought… it is similar to an idiom that makes possible the description of realities, the formulation of beliefs, and the experiencing of inner attitudes, feelings, and sentiments.” According to this definition, religion refers to one's primary worldview and how this dictates one's thoughts and actions. Other religious scholars have put forward a definition of religion that avoids the reductionism of the various sociological and psychological disciplines that reduce religion to its component factors. Religion may be defined as the presence of a belief in the sacred or the holy. For example Rudolf Otto's "The Idea of the Holy," formulated in 1917, defines the essence of religious awareness as awe, a unique blend of fear and fascination before the divine. Friedrich Schleiermacher in the late 18th century defined religion as a "feeling of absolute dependence." Other encyclopedic definitions include: "A general term used... to designate all concepts concerning the belief in god(s) and goddess(es) as well as other spiritual beings or transcendental ultimate concerns" and "human beings' relation to that which they regard as holy, sacred, spiritual, or divine." The models are not mutually exclusive. Multiple models may be seen to apply simultaneously, or different models may be seen as applying to different religions. Dominant world religions, mapped by country. Other sources quoted in this article put the percentages of various countries' populations who rank Religion (any denomination) as "Very Important" at small fractions of those used to compile the table below]. 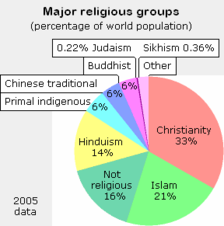 Christianity, Islam, Hinduism, Chinese folk religion and Buddhism are the largest world religions today. Approximately 69-78% of humanity adheres to one of these five religions. Christianity is the religion with the largest number of adherents, followed by Islam, Hinduism, Chinese folk religion and Buddhism respectively. However, the third-largest "group" of approximately 1 billion people do not adhere to religious approaches. Their irreligious approaches include Humanism, Atheism, Rationalism, and Agnosticism. These figures are necessarily approximate: note that the figures in the following table total nearly 7 billion people, yet the world population was only 6.4 billion (2005), and a person can claim adherency to more than one religion. World map based on the results of a 2002 Pew Research Centre study on the importance of religion. The largest religious gathering of humans on Earth . 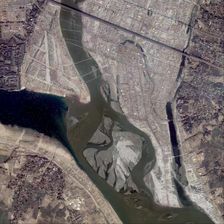 About 70 million Hindus from around the world participated in Kumbh Mela in the Hindu holy city of Prayaga, India, which is also known as Allahabad. Since the late 19th century, the demographics of religion have changed a great deal. Some countries with a historically large Christian population have experienced a significant decline in the numbers of professed active Christians. Symptoms of the decline in active participation in Christian religious life include declining recruitment for the priesthood and monastic life, as well as diminishing attendance at church. At the same time, there has been an increase in the number of people who identify themselves as secular humanists. In many countries, such as the People's Republic of China, communist governments have discouraged religion, making it difficult to count the actual number of believers. However, after the collapse of communism in numerous countries of Eastern Europe and the former Soviet Union, Eastern Orthodox Christianity has been experiencing considerable resurgence there. A 2002 Pew Research Centre study found that, generally, poorer nations had a larger proportion of citizens who found religion to be very important than richer nations, with the exception of the United States. Religious belief usually relates to the existence, nature and worship of a deity or deities and divine involvement in the universe and human life. Alternately, it may also relate to values and practices transmitted by a spiritual leader. Unlike other belief systems, which may be passed on orally, religious belief tends to be codified in literate societies (religion in non-literate societies is still largely passed on orally ). Religious beliefs are found in virtually every society throughout human history. Many native traditions held clowns and tricksters as essential to any contact with the sacred. People could not pray until they had laughed, because laughter opens and frees from rigid preconception. Humans had to have tricksters within the most sacred ceremonies for fear that they forget the sacred comes through upset, reversal, surprise. The trickster in most native traditions is essential to creation, to birth". 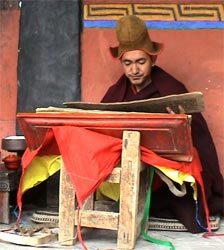 Religious knowledge, according to religious practitioners, may be gained from religious leaders, sacred texts ( scriptures), and/or personal revelation. Some religions view such knowledge as unlimited in scope and suitable to answer any question; others see religious knowledge as playing a more restricted role, often as a complement to knowledge gained through physical observation. Some religious people maintain that religious knowledge obtained in this way is absolute and infallible ( religious cosmology). While almost unlimited, this knowledge can be unreliable, since the particulars of religious knowledge vary from religion to religion, from sect to sect, and often from individual to individual. 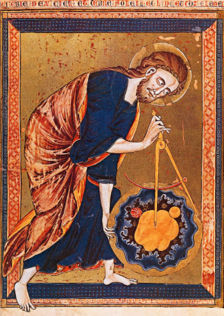 Early science such as geometry and astronomy was connected to the divine for most medieval scholars. The compass in this 13th Century manuscript is a symbol of God's act of creation. In the Bahá'í Faith, the harmony of science and religion is a central tenet. The principle states that that truth is one, and therefore true science and true religion must be in harmony, thus rejecting the view that science and religion are in conflict. `Abdu'l-Bahá, the son of the founder of the religion, asserted that science and religion cannot be opposed because they are aspects of the same truth; he also affirmed that reasoning powers are required to understand the truths of religion and that religious teachings which are at variance with science should not be accepted; he explained that religion has to be reasonable since God endowed humankind with reason so that they can discover truth. Shoghi Effendi, the Guardian of the Bahá'í Faith, described science and religion as "the two most potent forces in human life." 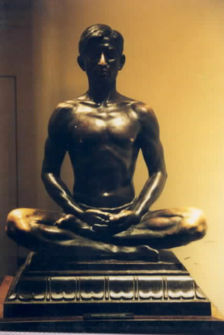 Mysticism, in contrast with philosophy, denies that logic is the most important method of gaining enlightenment. Rather, physical disciplines such as yoga, stringent fasting, whirling (in the case of the Sufi dervishes), or the use of Psychoactive drugs such as LSD, lead to altered states of consciousness that logic can never hope to grasp. Mysticism (to initiate) is the pursuit of communion with, or conscious awareness of ultimate reality, the divine, spiritual truth, or God through direct, personal experience (intuition or insight) rather than rational thought. Mystics speak of the existence of realities behind external perception or intellectual apprehension that are central to being and directly accessible through personal experience. They say that such experience is a genuine and important source of knowledge. Esotericism claims to be more sophisticated than religion, to rely on intellectual understanding rather than faith, and to improve on philosophy in its emphasis on techniques of psycho-spiritual transformation ( esoteric cosmology). Esotericism refers to "hidden" knowledge available only to the advanced, privileged, or initiated, as opposed to exoteric knowledge, which is public. It applies especially to spiritual practices. The mystery religions of ancient Greece are examples of Esotericism. Humanists believe that all religion is based on myth, meaning that it is based on legendary stories that are not in fact true. Humans have many different methods which attempt to answer fundamental questions about the nature of the universe and our place in it ( cosmology). Religion is only one of the methods for trying to answer one or more of these questions. 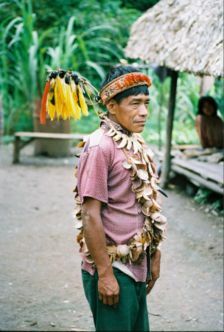 Other methods include science, philosophy, metaphysics, astrology, esotericism, mysticism, and forms of shamanism, such as the sacred consumption of ayahuasca among Peruvian Amazonia's Urarina. The Urarina have an elaborate animistic cosmological system, which informs their mythology, religious orientation and daily existence. Given the generalized discontents with modernity, consumerism, over- consumption, violence and anomie, many people in the so-called industrial or post-industrial West rely on a number of distinctive religious worldviews. This in turn has given rise to increased religious pluralism, as well as to what are commonly known in the academic literature as new religious movements, which are gaining ground across the globe. Most western criticism of religion focuses on the Abrahamic religions — particularly Christianity, Judaism, and Islam — with titles such as Why I am not a Christian, The God Delusion and The End of Faith representing some popular published books. Not all the criticisms would apply to all religions: criticism regarding the existence of god(s), for example, has very little relevance to some forms of Buddhism. Many people consider all religious faith essentially irrational. By definition, agnostics are skeptics of religion. Many critics claim dogmatic religions are typically morally deficient, elevating to moral status ancient, arbitrary, and ill-informed rules that may have been designed for reasons of hygiene, politics, or other reasons in a bygone era. People who break these rules are often condemned and victimised even though they have only done wrong within a particular religion's idiosyncratic conception of what constitutes right and wrong.